Things started on Nairobi time, we had some chai and samosa, now we’re beginning the sessions. There seems to be over 100 people here already. T-shirts are being handed out, and we’re passing out O’Reilly books and Yahoo freebies during the day. My Barcamp pictures are going up to this set on Flickr. Where are the devs? 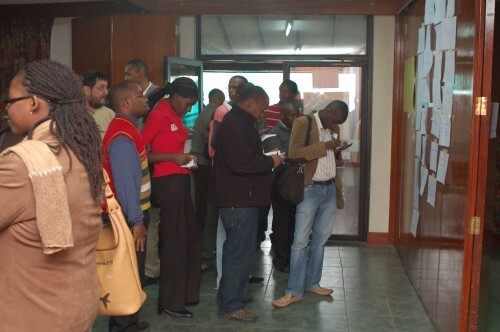 – Riyaz Bachani talks about the increasing bandwidth options in Nairobi, but asks where are the online entrepreneurs? 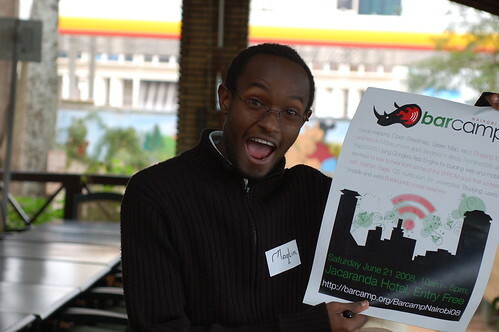 Google Maps as Platform – Mark from Google Kenya talks about using Google Maps in detail. BugLabs – Brian Muita gives an overview of hacking the BUGbundle, showing his new accelerometer game, then opening up the device for hacking by devs today. Ubuntu – Mzungu talks about using Ubuntu, LTSP server, and running applications on the server instead of the workstation. Jahazi – Mugambi talks about his app. I’ll be going up in the third session, talking about “blogging tips and tricks”. I thought Barcamp was at the 680 hotel? Looks like a lot of fun! Interesting about Plone. I was researching it for a while as a platform. Let me know if you get any new ideas. Chai and Samosa?!! Hash i could swear you are trying to make me teleport myself there 🙂 samosa?!! omg. Looks like too much fun; enjoy it and pass my regards to the other TedSters and friends there. Pics are lovely! loved it, but now talks should be on for our first bloggercon, just discovered we are seriously deficient on blogging skillz, SEO, Link building and baiting etc! A blogger conference would be neat too! I’ll second Nairobian Perspective… I did a presentation (available at http://www.peperuka.com/BARCAMP08_PEPERUKA.pdf by the way – before the Wiki page goes dead) about Website Optimisation. So, when I spoke about canonization and double content issues, robots.txt and .htaccess, scrapers and bad bots, spoke about Matt Cutts recommandations, I am sure most of you were lost (if not bored). It shows that there is indeed a need to educate bloggers on SEO (Search Engine Optimisation) for better ranking and therefore, opportunity to blog for cash. We(moez, meeten and ali) came all the way from Dar es Salaam, Tanzania for Barcamp Nairobi 08, which was a great learning experiance , got to know tech gurus and the work they do. it will be nice coming back for something alike. Tanzanians? are you the three masketeers I saw? WOW! I’m smiling from ear to ear. Its my hope that you learnt alot but let it not stop there. GO and DO/IMPLEMENT what you learnt.